Taking a boat tour in Tam Coc will lead you to the places where most of the photos from Ninh Binh area are taken. Have you seen that river surrounded by rice fields and mountains? Here you will have the chance to see it in real life. I absolutely loved this place and I recommend this boat tour as a must see if you are in the Ninh Binh Province. You can also easily link this trip to other nearby attractions such as the famous Hang Mua Peak, the Thai Vi Temple which are just 10 minutes away from the start of the Tam Coc boat tour or the Bich Dong Pagoda. Tourism in Vietnam rose sharply in the past years and Ninh Binh is not an exception. The higher influx of tourists means that the people who are rowing the boats must work longer hours. 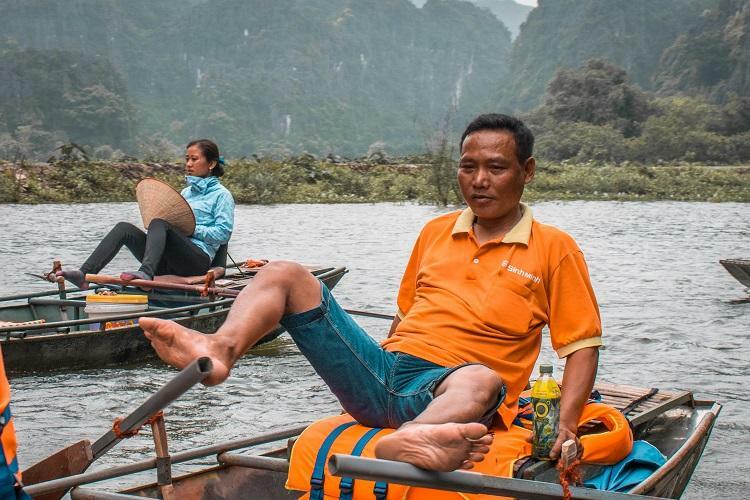 Since tourism is a great source of income for local people and rowing with the hands can lead to severe back pain, Vietnamese people came up with an ingenious idea – feet rowing. Rowing the boat by feet is not only faster but it also involves less effort. Another advantage is that while using their feet to row, the people can use their hands for other activities such as using the phone, eating or drinking water. Since this method is quite effective, many people have picked it up. The Vietnamese people rowing the boats by feet have become popular and a real attraction of the Ninh Binh Province. Read more about all the Ninh Binh must see attractions here. 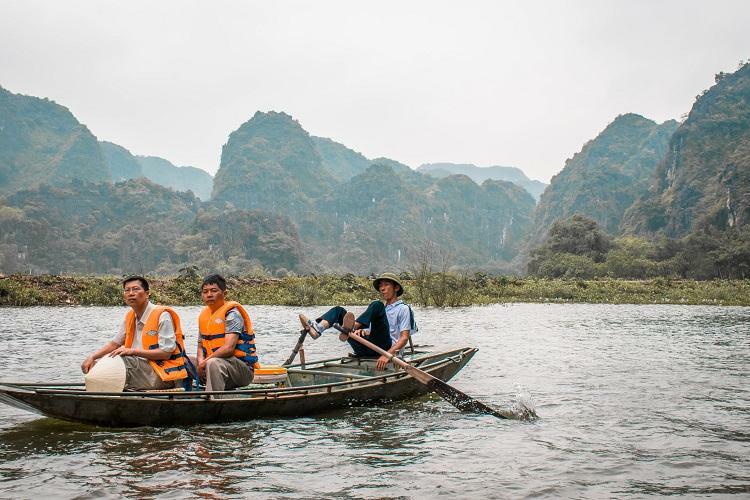 Many locals rely on tourism as their main source of income, including the ones who row the boats in Tam Coc. By taking a boat tour, you basically help the local people have a better life. Don’t forget to leave a tip at the end – those people are working really hard! Ninh Binh is well know for its spectacular views with mountains popping out of the rice fields. This boat tour will allow you to experience all that while taking a relaxing boat ride. At about the middle of the boat ride you will have the chance to admire the Hang Mua Peak from a different perspective. Also, if you are lucky enough you will see pigs swimming in the river (no, I am not kidding). The boat can accommodate maximum 2 people. Even though this is written at the ticket office, I have seen boats with more than 2 people. However, I would strongly recommend to follow this rule. The more people in the boat, the harder it will be for your guide to row. If you are planning a boat tour in the middle of the day, don’t forget your hat home! Also, bring some water with you. Important! – you will see that at the end of the tour, after you will exit the cave, there will be some boats which sell with fruits, food and drinks. Those people will try to convince you to buy a ‘tip’ for your guide at an unreasonable price. They will go a long way to make you feel bad if you don’t buy anything. My advice for you would be to not give in. Giving your guide money as a tip will definitely help him more than buying him a soda. If you are wondering how much you should tip him, I would say that anything between 20,000 VND and 40,000 VND would be great. However, you can tip any sum of money you want. For example, if you are 2 adults you will have to pay 150,000 VND for the boat and 120,000 VND x 2 which is a total of 390,000 VND. These are the best choices if you are visiting Tam Coc from Ninh Binh city. You can rent a motorbike for a full day or take a taxi (around 15,000 VND per kilometer). There are daily buses from Hanoi to Tam Coc and they cost around $7 or 154,000 VND. For more details, click here. If you are planning to visit it from the Southern part of Vietnam (Dong Hoi, Hoi An) there are also plenty of buses to choose from. However, keep in mind that these buses will leave you in Ninh Binh city. You will have to take a taxi from there to Tam Coc. I definitely recommend staying in Tam Coc over Ninh Binh city if you want to explore the Ninh Binh Province. The biggest advantage is that it is close to all major attractions. You can bike to most of them or explore by motorbike. I am sure you will have an amazing time and you will love the Tam Coc boat tour. Those views are incredible and the Vietnamese people rowing with their feet will make the experience even more authentic. It is definitely a must visit in Ninh Binh. Very helpful and detailed post! I have been to Vietnam only in Ho Chi Minh, but will go again soon to explore more, it looks really beautiful. Keep up the good work! Did not know that’s how they came to row with their feet! Thanks for the read, and breaking down what to expect in price! Thanks so much! Tam Coc is such an interesting place!